When you have millions of location data points, figuring out how much more accurate GPS is compared to Wi-Fi is a snap. Luckily, Yelp just happens to have that type of data, captured through users of its app who check-in at various business locations. Earlier this week, the company scoured the data and shared the results in a blog post. It turns out GPS is twice as accurate than Wi-Fi for very fine data and, possibly due to low-end devices with inexpensive GPS chips, Android(s goog) devices as a whole are less accurate than iPhones(s aapl). 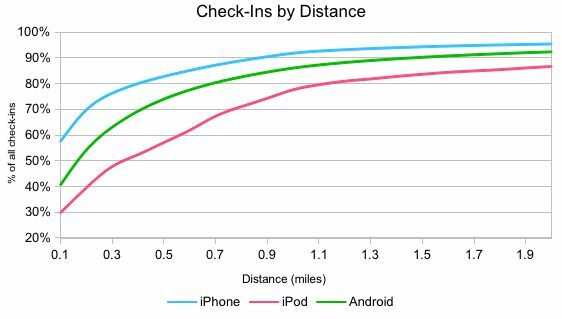 Yelp took a deep dive into the geolocation data from June and ended up with a nice chart showing the difference in accuracy from check-ins on the iPhone, Android(s goog) devices and the iPod touch, which has no GPS and therefore relies on Wi-Fi-based location data. As expected, the GPS devices are far more accurate than a Wi-Fi only device. Nearly 60 percent of all Yelp check-ins were within 0.1 miles of the actual location on iPhones in June, while just 30 percent of iPod touch check-ins were as accurate. Surprisingly, the Android devices were closer in accuracy to an iPod touch, even though nearly all Android devices have GPS chips. If you can live with some tolerance for location data, Wi-Fi isn’t terrible: Yelp’s data shows that 79 percent of all iPod touch check-ins were within a mile of the business location. That doesn’t sound like it’s good enough to ever displace GPS when out and about, but Wi-Fi certainly works better for indoor location needs such as in a mall, large retail store or educational facilities. As a result, both types of geolocation methods are likely to be used in a hybrid form for some time to come. I find it hilarious, but typical, that the only conclusion for the difference between the iphone and android phones is that the android phones must have cheaper gps chips. The obvious conclusion is that android phone users more frequently turn off gps than do iphone users to conserve battery. They do this for 2 reasons – 1) battery life is often less on android phones 2) it is easy to have a widget on your homescreen to control such functions in android. Kind of misses a key point Kevin. iPhone and Android are using BOTH Wi-Fi and GPS positioning. It is not the GPS is that much better, it is that GPS+Wi-Fi is that much better than just Wi-Fi. If you just looked at GPS alone you would see much lower numbers because you are inside typically when you are checking in using Yelp. Any idea if in their analysis they can tell whether a smartphone has all 3 types on? When I use check-in based apps, I tend to just rely only on cell tower triangulation because I’m too lazy to turn on wifi and GPS (which takes a bit of time to lock onto my location). Seems to me this indicates they dont have that data – how could they? And if they did have it i would expect a comment about that. I suspect if they did have that data, the gps checkins for android and ios would be similar. In fact, using this information to try to infer that iphones have more accurate gps chips is ridiculous. The default location setting on Yelp for Android is Coarse (Network-based) location. That’s prolly why the accuracy is closer to iPod touch class.